My acc is still locked sir. I bought once fake or dipped tix and coke locked acc to check I waited for unlock but is still locked can u unlock it? Please? This is my alt acc cuz main is hacked and I'm trying catch hacker on pms and I'll add all pic I have and all I'll get hope. Thx. marianm wrote: My acc is still locked sir. I bought once fake or dipped tix and coke locked acc to check I waited for unlock but is still locked can u unlock it? Please? I've never played with my main on public computers and I bought fake tix and transfered to my main before I've been locked on my both(main and marianmocreac (main was marianm)) and coke checked that and took the fake tix and idk if he forgot or.. But he didn't unlocked alt. patz753 wrote: Hi Oxidan, my alt account _Prey has been banned for over a year now. I do not know how it got banned as my friends played on it and I don't know the password or email used to check why it's banned. I asked coke if he can tell me why it's banned and if it can be unbanned, he replied with "none". If anything can be done please pm me or reply here. Hi Moderators, I have been banned for nearly an year or so. I have not been on my account and when I went to play on it back it said that my account has been «LOCKED FOR PH ACCESS», So for that amount of time I wasn't on my account at anytime since I was occupied with college. If by any mean i could have my account unlock. I would like to know what does mean «PH ACCESS» and get unban, I am also from Canada but my friends also are from Canada but didn't got locked. Thanks you, and have an nice day! Here is an screenshot made today, on April 8 2019 and I was last connected on Helmet Heroes on June 9 2018. Today, I was in Pet building floor 3 farming off of spawn balls when a guy who was about lv 1000 in The Deathless Reborn consistently told me to refresh my page. He said that "there was a new pet dragon" and that he "wanted to show it to me". He even offered to give me 500k and a santa hat if i refreshed. So, being conspicuous, I teleported to fairyville to see if I would disconnect, and sure enough, I did. When I tried to log back on, it said i was banned until 4/27/19. I do not understand why this happened!! Not trying to make assumptions, but it seems to me as though this guy was abusing his power by banning me so that he could farm off the spawn balls himself. Please help!! I'm McMacOco. I would like to request to you to review my account(McMacOco). Its autobanned for purchasing 50 tickets via steam wallet. I will appreciate your respond as soon as possible. Thanks. This is _Parzival3_ i got banned for trading money to my level one account please unbann i didnt do anything wrong. i spent money on that account and i really am mad that it got banned. My account Archerbrine got unbanned and i'm unsure why could you tell me the reason? i haven't done anything on it bad. i've been trying to find out why it got banned but no one responds so i've come here. 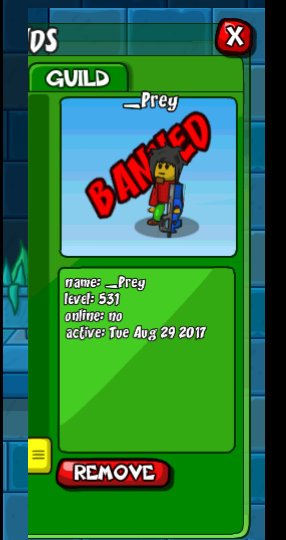 If it can get unbanned i would be grateful i been playing this game for awhile and i miss my account, or atleast tell me WHY it is banned cause not even knowing why it is banned is very annoying since i've spent quite a lot of money on this game. EDIT: The info up there is null and void i am completely ip banned not my account this has gotten me more worried. I tested this by asking my trusted friend to get on my account and he said it wasn't banned but when i try it says i am banned I'm actually freaking out now i have spent so much time and money into this game and i don't know why i am losing it.